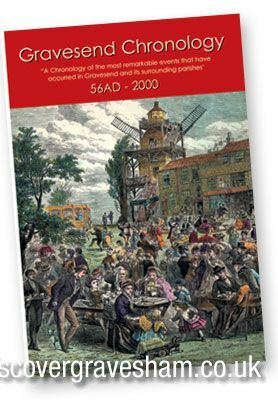 The Gravesend chronology, previously produced by Gravesend Library in five parts, was originally based upon the work published by Robert Pocock in 1790 entitled "A Chronology of the most remarkable events that have occurred in the parishes of Gravesend, Milton and Denton ..." The Series proved extremely useful for students, and those interested in local history, as a background to the history and development of Gravesend and the surrounding area. This new Chronology has been completely revised and extended it is a series of snapshots in time, meant to serve as a guide and to encourage the reader to explore further the sources of information on the history of the area. All the sources used in the compilation of the chronology are available in the local studies collection of the Gravesend Reference Library in Windmill Street. Staff there will be happy to help with any history enquiries. Gravesend and the surrounding area have a long and fascinating history. Its position on the River Thames, close to London, has drawn many people, from places far and wide to its shores; some famous, a few infamous and many more less distinguished - but all have contributed to its rich heritage, creating the place we know today. A huge thank you to Gravesend Library for permission to use this publication. Visit the publications page for more information about this book and where to buy a copy.